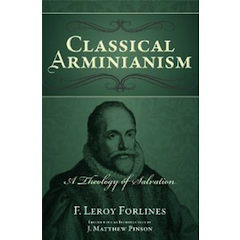 As of the last two days or so, I have been commenting on Dr. F. Leroy Forlines’s book titled “Classical Arminianism: A Theology of Salvation.” This book is a spin-off of Dr. Forlines’s “The Quest for Truth,” and was written with the hopes of providing a systematic theology for Classic (Reformed) Arminians everywhere. I am so grateful to Dr. Matthew Pinson, President of the Free Will Baptist Bible College, for his editing work in this text. I met Dr. Pinson down in New Orleans at the Apologetics Conference on the campus of New Orleans Baptist Theological Seminary. Dr. Pinson gave a fine presentation on General Baptist leader Thomas Grantham, and his theology that could easily be labeled “Reformed Arminianism.” Grantham was really dismayed at the so-called “Arminianism” of his day, viewing it as semi-Pelagian at best, and full-blown Pelagian (or possibly Wesleyan Arminian) at worst. I am encouraged by the work Dr. Pinson is doing for Dr. Forlines and the kingdom of God at large. Back to Dr. Forlines’s Systematic Theology. Today’s biblical text that I will tackle in post discussion is Romans 8:35-39. The text itself concerns the believer. Romans chapter 8 is very clear on this point. In verse 1 of the chapter, we see that the subject of the text is “those who are in Christ Jesus,” which is a clear reference to the believer. In verses 8-9, Paul distinguishes between those who are “in the flesh” and those who are “in the Spirit.” The believer is in the latter category, those who are “in the Spirit,” since the Spirit dwells within believers (Rom. 8:9). However...and here’s where the problems come in for those who interpret Romans 8 as pertaining to the issue of perseverance...the text actually discusses eternal death for the believer who does the works of the flesh: “For if you live according to the flesh you will die; but if by the Spirit you put to death the deeds of the body, you will live” (Rom. 8:13). My question is, who is given the warning here? Christians, those who have the Spirit. Paul is not here talking to the unbeliever, but those who possess the Spirit. In fact, Paul can talk in the manner he does because they have the Spirit, and can put to death the deeds of the body. He could not make this statement if the audience consisted of unbelievers (which is why he clearly states in Romans 8:8 that the unbeliever cannot please God). In verse 15, once more, we see that the Roman believers had “received the Spirit of adoption” by which they could refer to God as “Abba,” meaning “Father.” In verse 16, the Spirit authenticates our salvation, testifies with us that we are children of God. In verse 17, Paul writes that we are heirs and joint-heirs “IF INDEED WE SUFFER WITH HIM, that we may also be glorified together” (Rom. 8:17, NKJV). Paul gives a condition to glorification: that is, that glorification will not come without sanctification (which involves suffering). We must suffer with Christ, take up our crosses and follow Him (Luke 9) if we desire to reap the benefits of glorification (as Christ has done). Romans 8:17 affirms the words of Romans 8:13 about “putting to death the deeds of the body.” It is the same idea in mind when Paul writes to Timothy to “fight the good fight of faith” (1 Tim. 6:12), using the Greek word “agonizo” (to agonize) for the word “fight.” To agonize is to experience pain, and the idea of Paul’s thorn in the flesh comes to mind. It is what Paul refers to in 2 Corinthians 4: that we are “always carrying about in the body the dying of the Lord Jesus, that the life of Jesus may also be manifested in our body. For we who live are always delivered to death for Jesus’ sake, that the life of Jesus may also be manifested in our mortal flesh” (2 Cor. 4:10, 11). The text has shown us thus far that we have to “put to death the deeds of the body,” mortify our members on the earth, and that we must “suffer together with Christ” in order to experience glorification. The message of endurance (perseverance) is emphatically displayed in this text. If perseverance is as important as Paul believed it to be, then eternal securitists have a problem: for perseverance then becomes a “condition” (Oh no! I’ve said the dreaded word) for final salvation. Romans 8:24 tells us that “we were saved in this hope.” What hope? The hope of salvation. The end of verse 24 also makes it clear that the salvation we desire has not yet been actualized: “why does one still hope for what he sees?” If our salvation were fully manifested, there would be no need for hope. The presence of hope in salvation serves to show us that, while some aspect of our salvation is present now, there is a fullness to our salvation that has not yet been made complete. We are not home with God yet, so there is more of our salvation to come than what we have already received. The hope of salvation serves to show us that, while we can be “certain” and “assured” of our salvation, we cannot become so presumptuous as to deem that final salvation is “guaranteed.” There is a difference between certainty and necessity. It is certainty that we have in the Christian life, not “necessity” (not that salvation is necessarily ours). Verse 25 tells us that, since we can only “hope” for salvation here in the present, we must “wait for it with perseverance” (Rom. 8:25). “Putting to death the deeds of the body” (Rom. 8:13) and “suffering together with Him” (8:17) come to a climax in 8:25. The word for these phrases is “perseverance.” Paul assumes that perseverance is a given, not optional, for the person who waits for their salvation to become a present reality. Proponents of Eternal Security (ES) must ask themselves, “If perseverance is mentioned in this chapter, and we are to wait for our salvation with perseverance, is perseverance not necessary?” This is where a proponent of Eternal Security would respond, “Yes, perseverance is necessary; but the Lord is the one who perseveres us.” If that were the case, why does Paul place the responsibility of perseverance upon the individual? Why does he say, “If we suffer together with Him,” instead of “Since the Lord will persevere us, we will be glorified together”? It seems that the emphasis in the text (at least the great majority of the chapter) is on the individual enduring and persevering in the faith. “Rather, it teaches that a person who is a child of God can never, at the same time, be separated from God’s love. In other words, the believer is never to interpret hardship as meaning that God does not love him. Instead, he should recognize that God’s love is still with him...” (Classical Arminianism, page 312). Romans 8:31 tells us that “God is for us.” Who is the “us” that Paul mentions in that verse? Believers. After all, in Romans 8:8-9, Paul has already distinguished between the unbeliever, who cannot please God, and the believer who can (because he or she has the righteousness of God applied to their life). In verse 33, Paul refers to the believers as “God’s elect,” God’s “called-out ones.” In verse 34, Christ makes intercession for His elect. Who are the elect? Believers. Believers are the subject of Paul’s discussion here. Why is this important? Because believing in Christ is the condition for experiencing the unconditional love of God. No Christian, whether in agreement with OSAS (Once Saved, Always Saved) or not, would argue that an unbeliever could use these verses and claim he will experience eternal life, regardless of whether or not he believes. If that be the case, then there is a condition to experiencing the love of God in Christ: that one must confess and believe on his name (Romans 10:9; John 3:16, etc.). So, what is the meaning behind Romans 8:35-39? The meaning is that the believer is not separated from God’s love. Even in tribulation (for example), he is still loved by God. Tribulation does not signal that the believer is outside of God’s love. Rather, the believer experiencing tribulation is in accord with the Scriptures which state that those who are in Christ Jesus will be persecuted (2 Timothy 3:12), as well as Jesus’ own words that “In this world you shall have tribulation” (John 16:33). Romans affirms the words of both Jesus and Paul. Nevertheless, Romans 8 cannot contradict itself. And for those who argue that Romans 8:35-39 means that “nothing” (interpreted as “perseverance”) can separate us from the love of God, Romans 8 must contradict itself. After all, did Paul not tell believers that if they do not “put to death the deeds of the body” (v. 13) that they will eternally die? Did he not also tell them to “suffer with Christ” in order to experience glorification (v. 17)? Did he not tell believers to wait for their salvation “with perseverance” (v. 25)? If Paul were to then turn around in verses 35-39 and say, “You don’t need to put to death the deeds of the body, you will experience eternal life anyway,” would he not contradict the words of Romans 8:13? If he turned around and told the believers, “you do not need to suffer with Christ, you will be glorified regardless,” would he not contradict the words of Romans 8:17? If Paul told the believers, “You do not need to have perseverance, you will be saved without it,” would he not contradict the words of Rom. 8:25? All of this is to say that Paul cannot turn around at the end of Romans 8 and do away with everything he has said in the first 34 verses. To do so would mean that the Scriptures contradict, which is something that most evangelicals consider to be an outrageous thought entirely. When Paul says that “tribulation,” for example, cannot separate one from the love of God, he is not talking about the need to persevere in the tribulation; rather, he is talking about the event of tribulation itself (including our sin). When we are struggling with our sins, God still loves us in spite of our struggles and always makes a way of escape for us in such times (1 Cor. 10:13). However, perseverance (as Romans 8 itself has revealed) is necessary for final salvation. We must suffer together with Christ, we must carry our crosses, if we are to be glorified with Him. Tribulation does not separate us from the love of God in Christ...but we can separate ourselves, whether “we” refers to unbelievers who never receive Christ, or those who were formerly believers who “depart from the faith” (1 Tim. 4:1; see also Jude 21). Wow, I happen to run across this site and started reading. I was drawn to your subtitle that says you are , "...dedicated to the exploration, analysis, and evaluation of various theological systems". This article doesn't seem to reflect that objective intent though. To me, it all reads as yet another Reformed Calvinist website that is dedicated to the aim of proving Arminianism to be wrong. When it all comes down to it, these theological debates can easily be solved by agreeing that simple REPENTANCE is the answer. Whatever perspective you subscribe to, repentance is always the solution. Why continue to split hairs on theology? Without faith in Christ we are lost. Without repentance we are doomed. In order to grow in that faith and share the love of God with others on a daily basis, we must constantly die to ourselves. Any other intellectual dueling is utterly and completely a distraction from the work we should all be doing in these very important days as we share the gospel to a lost and dying world. Jesus will return, looking for His bride, but will it be without spot or wrinkle? Will we continue to debate these points, or work together in unity, concentrating on the issues that matter the most? I long to see the day when Christians join together in unity and love as Christ calls us to do. I am really sorry that you seem to misunderstand the post as well as the blog. This blog is actually not a Reformed Calvinist site. If you read any of my work on the Doctrine of Perseverance, you will know that I am Arminian (Classic Arminian) in my theology. While I do hold to tenets of Reformed theology, I do not agree with all Reformed theology. Next, you talk about how we split hairs on theology and this is offsetting us from the task of spreading the good news of the gospel. I have a question for you, however: how can we share the gospel to a lost and dying world if we are divided on what it actually says? So, the Calvinist goes to evangelize, and what does he tell sinners? "Turn from your sins, believe in Christ, and God will save you?" There are many that have done this, but they do not believe it. How do I know? Get in a Calvinist church, and what will you hear? "God has selected some for salvation and others for damnation." Even the Calvinist churches that disagree with certain tenets of Calvinism do so because they believe that God is love and would never damn anyone to Hell. However, their theology would uphold such a view. What will an Arminian tell sinners? "Christ died for the sins of every individual, and you can be saved if you would only confess and believe on Christ as the Son of God." This sounds to me as though it is more of the gospel message than what a Calvinist would say to a sinner. I'm all for the gospel going to the ends of the earth. However, I think our theologies should match the truth found in the text. And when we can tell people that Christ died for all, while holding to a theology that says Christ died for some, the problem lies not with the text--but with ourselves. I think you make the statement above that you do because all you are focused on is the love of God. However, does Paul not write in 1 Corinthians 13 that "love rejoices not in iniquity, but in the truth?" If this is the case, then God is not glorified when we say one thing and believe another, as Calvinists do. No--He is glorified when we preach a message consistent with the gospel we claim to uphold. I pray that you will see a greater connection between love and truth in the coming days. God bless.